Walnuts are arguably the most useful type of nuts. They are delicious, nutritious and considered to be the best source of natural protein. For centuries, walnuts have been playing a role of a key ingredient of the Mediterranean diet, along with olive oil and seafood. These nuts are harvested in the late autumn or early winter, and they are available year round as we consume them only dried. Walnuts can be a special adding to our fruit and vegetable salads, red meat, stews, bakery and other meals. Walnuts are considered to be among the best natural sources of omega 3 fatty acids, which our body can’t produce on its own and can only get from outside sources. Omega 3 fatty acid is essential for LDL cholesterol lowering, as well as for reducing the risks of colt formation and developing serious heart diseases. Other important health benefits of walnuts are stipulated by a high content of antioxidants (including vitamin E) in this food, which assist in slowing down aging processes in our body and also can protect us against cancerous cells and tumor formation. Adding walnuts to your diet is linked to improved digestion and cardio-vascular function. Omega 3 fatty acids assist in preventing arrhythmia and controlling blood pressure, and antioxidants are of a great help for keeping natural chemical balances in the body on normal levels. 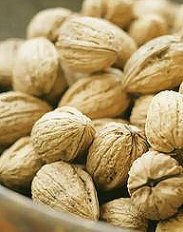 But probably the most known and valuable property among the health benefits of walnuts is the power to boost our brain function, improve memory and our mental abilities, protect us against atherosclerosis and so on.